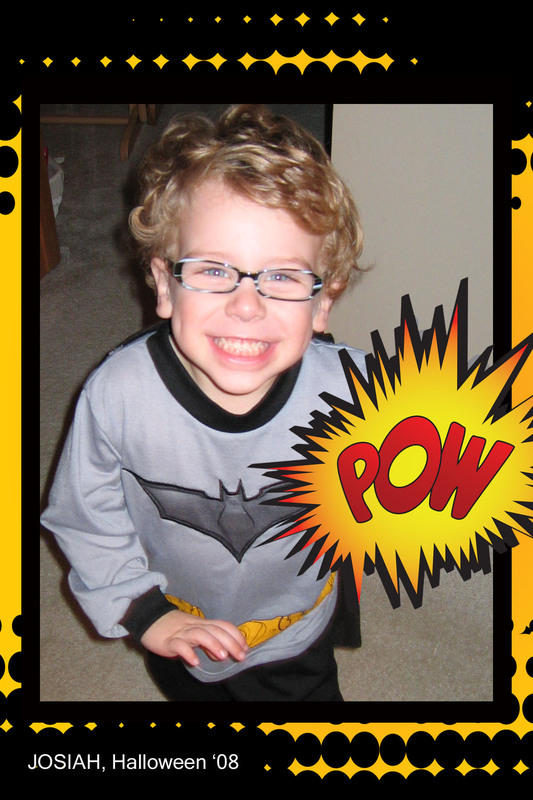 For the second year in a row, Josiah is a superhero. Last year it was Superman, this year Batman. A little piece of advice to parents of autistic toddlers….these pajama costumes are quite handy. We’re lucky some days to get Josiah to wear his shirt, pants, and coat, so I can’t imagine him wearing some elaborate, bulky costume. But he likes wearing these as they double as pj’s and are super comfortable. The cape in the back comes off with velcro too. As you can see, he’s got to be about the cutest little Batman you’re ever going to see. Props to my wife for the little design she did with this picture. I have to say to that it’s fitting Jo Jo is usually a superhero for Halloween. I think he’s something of a superhero everyday. He keeps a smile on his face even though he has to work so much harder than other 3 year-olds and we expect so much more out of him than any little guy his age should have to. After numerous spills with Josiah’s beverages we decided it was time to get our carpet professionally cleaned. All of his supplements cause his drinks to turn some crazy colors that leave some nasty orange and green stains. My wife found a company that specializes in ‘green’ carpet cleaning (meaning non-toxic, not the color green as we already have enough of that). We thought they did a great job with the carpet and we can feel good knowing we didn’t use a bunch of chemicals that could harm Josiah. But Josiah was not too impressed with their work. We had to move everything off the floors including Josiah’s toys. When we got home and he couldn’t find his usual stash of toys, he was quite upset. He stuck his little lip out and started sobbing. Then he looked at me with the saddest eyes and he said, “Don’t cry!” It was hard not to laugh even though I felt bad for him. Whenever we’re trying to soothe him when he’s upset we’ll softly say, “Don’t Cry.” Now more times than not when he’s crying he’ll say that to us. Luckily my wife and I were able to be heroes on this day when we brought some of his toys back up. He immediately grabbed some of his favorites and went to town. This gave us a good opportunity to try to thin out some of the toys so we don’t have so many out at once. So all was well last night….clean carpet, happy kid….and no more crying. Well it is harder than it seems. Some days I’m too busy. Other days I just don’t feel like it. But I guess I have to remind myself that this is a good release and it doesn’t have to be novel-worthy every time I post. Although if there are any publishers reading this who would like to advance me a sizable amount of money to start a book of my thoughts, I can try a little harder. Anyway, just a quick, funny story that happened recently. We are so thankful Josiah is verbal. Anytime he says anything, I am happy. It’s still mostly of the one-word variety but every now and then he’ll bust out something with two or three words. I was so proud of him. Not only is it funny, but it’s a good, spontaneous request. And I guess it worked because she stopped singing. I told him I couldn’t agree more. This past year has definitely had its share of ups and downs and I shudder to think where I’d be if I didn’t laugh from time to time. Sometimes I laugh at something funny my little son does. Other times it might be at a favorite tv show. And sometimes I just have to laugh at the absurdity of my everyday life. 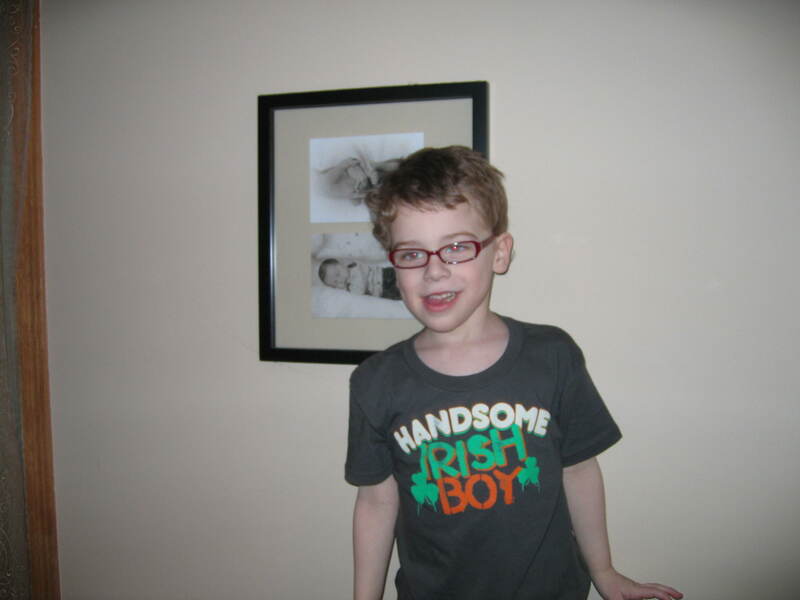 As you can tell by any photos of my son on this blog, he wears glasses. When we first though he had autism last year we also noticed he would squint and it seemed like maybe he was having difficulty seeing. For a brief day or two we thought perhaps his eyesight was solely to blame for developmental delays and not autism. Unfortunately we found out he has autism AND is quite farsighted. It took us a good six weeks or so to get him to wear his glasses. It was a stressful battle and there were definitely days we didn’t think we’d ever get him to wear the things. But eventually he relented and for several months now he’s been wearing them without incident. That is, until this week. For some reason starting on Monday morning, he’s been refusing to wear his glasses. He’ll swat at our hands the minute he sees the glasses coming close to his face. He eventually did wear his glasses on Monday after a nap at school. But first thing Tuesday morning he started rejecting the glasses again. He didn’t wear them at all yesterday and as of this morning when I dropped him off at school he was still not wearing them. What could be the cause for this sudden behavior? We have many theories, but there’s really no way of knowing. Perhaps it’s actually a good sign that he’s showing some typical 2-year-old characteristics by displaying his dislikes. Maybe the glasses are now uncomfortable or the prescription needs changing. Unfortunately with the communication barrier we have, we’re not likely to get an answer anytime soon. So where does laughter come into all of this? Well, as stressful as this has been to see all our hard work with the glasses start to evaporate, my wife and I have had to step back and laugh a bit at our current glasses standoff. Either we are just getting better at dealing with these daily challenges or we’re just going a little crazy. Maybe a little of both! At least in the midst of all, my son has also shown a sense of humor. This morning we were trying a lighthearted approach to getting him to wear his glasses. My wife started tickling him and telling him that he needed to wear them. So what does he do? He starts looking at us with an impish gleam in his eyes and keeps saying, “Glasses! Glasses!” I know somewhere inside of this kid lies a little jokester. As he teased us with those words, all we could do was laugh. So we’ll see who breaks first with this glasses standoff. My hope is it’s just a passing phase and in a few days we can try to find something a little less stressful to chuckle about. I think it is true that laughter really is the best medicine. Josiah’s always been a pretty happy little guy, but we’ve definitely gone for periods of time where we don’t hear a lot of laughter in the house. Over the past couple of weeks though, he’s been giggling up a storm and it really has done this heart some good. Up until recently he just wanted to hear you whistle and he was content with that. But now for some reason he gets such a charge out of us whistling that he just laughs hysterically. A couple of weeks ago my wife was out with some friends so it was just Josiah and I home for dinner. He was glued to one of his favorite tv shows and I was just kind of sitting there eating, feeling sorry for myself. All of a sudden, Josiah looked over at me and gave me the biggest smile and a giggle. It totally made my day and lightened the mood considerably. So I guess this post isn’t anything deep (not that it has to be). I’m just enjoying some of the simple things these days. There were days when we first started dealing with autism in our lives that the thought of laughing seemed so far away. It’s nice that it’s making a comeback. Apparently that wasn’t it so we started to drag out every toy the kid owns to see if that’s what ‘ma ca ca’ was. He finally got over it and we breathed a sigh of relief. We didn’t even remember it the next day until once again out of the blue our little dude started persistenly asking for ‘MA CA CA!” Oh no, not again! So this went on for a while…we’d get a reprieve for a few days and then this ‘ma ca ca’ business would start up again. We’d jokingly shake our fists and rue the day ‘ma ca ca’ ever came into our lives. Then one morning my wife happened to pick up our son’s plastic harmonica and was playing it for him when he first woke up (nothing better than starting your day with the soothing sounds of the harmonica!). All of a sudden our son smiled and said “Ma Ca Ca!” Ohhhh…Harmonica! I guess that makes sense. He used to just call it ‘ca’ so I’m surprised we didn’t figure that one out sooner. So our sleuthing is over for now until the next “ma ca ca” surfaces. I guess I’ll use the downtime until then to learn the real words to the Macarena in case he starts liking that song.